Day 30….DAY 30!!! For 30 days in the month of March, Joe and I completed (and pretty damn well if you don’t mind me saying), the whole 30 eating plan! I won’t get into too much details about what the diet is about, because you can read about it here. But basically, we both felt like we needed a “re-set”. So for 30 days we focused on eating “whole foods”, clean proteins, no dairy, more vegetables, and fruits and eggs and most importantly…NO added sugar! There are definitely limitations to this way of eating, but we wanted to focus on what we CAN eat and not what we can not. So for 2 weeks before we started, we prepped, planned and pinned shopping lists, recipes and snack ideas and everything in between. One of the biggest things we noticed was eating breakfast! Joe and I had a bad habit of waking up and starting our day with coffee and not eating until late afternoon when we were starving! 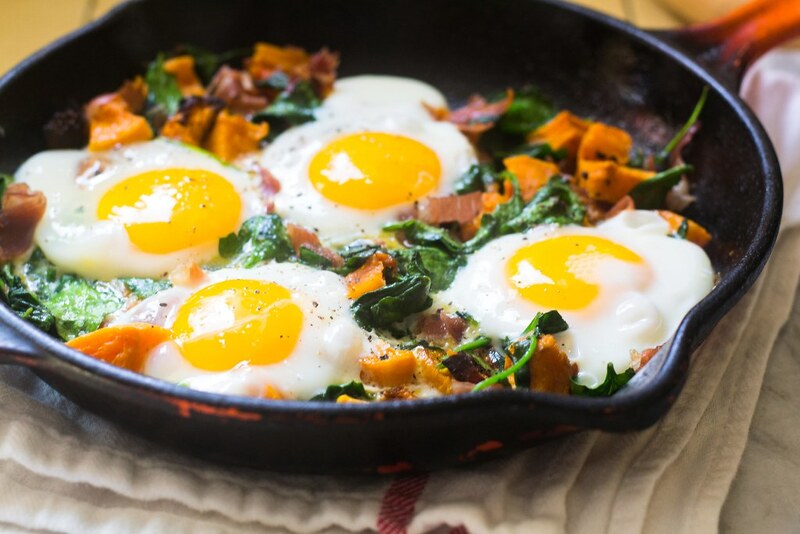 Instead, Whole 30 teaches you to start your day with a healthy protein filled breakfast (just like a veggie filled fritatta would be perfect!) Did we get sick of eggs throughout the month?? No way…we enjoyed delicious veggie packed hashes all month long! I’ll be sharing some of the recipes we had through the month, but here is a general idea! 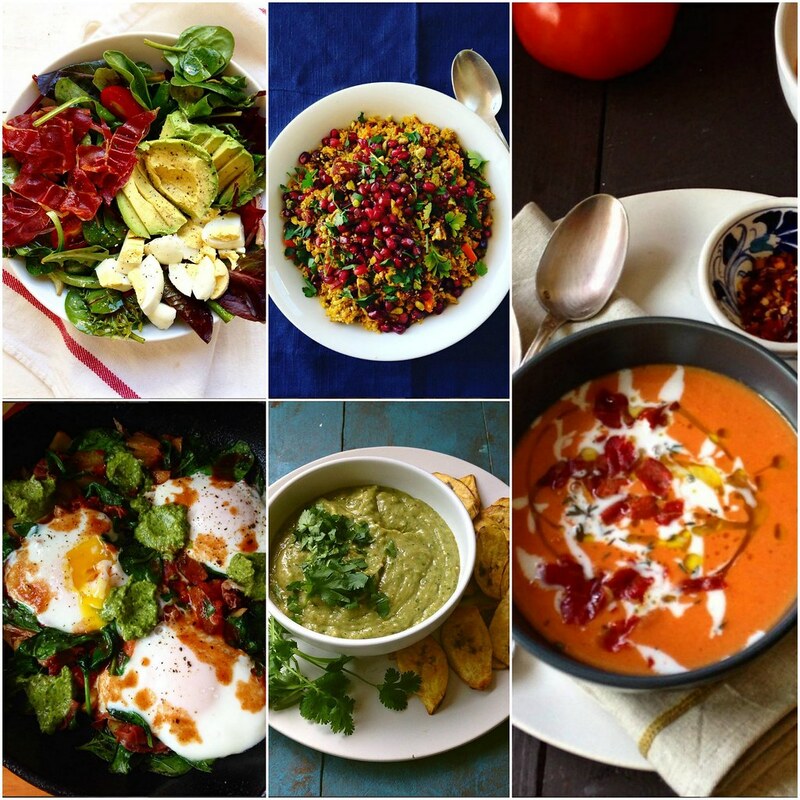 Clockwise Top Left: PLAT salad with prosciutto and egg, Persian cauliflower “rice” with pomegranates and dates, Roasted tomato soup with speck, Tomatillo Avocado salsa with plantain chips, Egg and veggie hash with tomatillo avocado salsa. 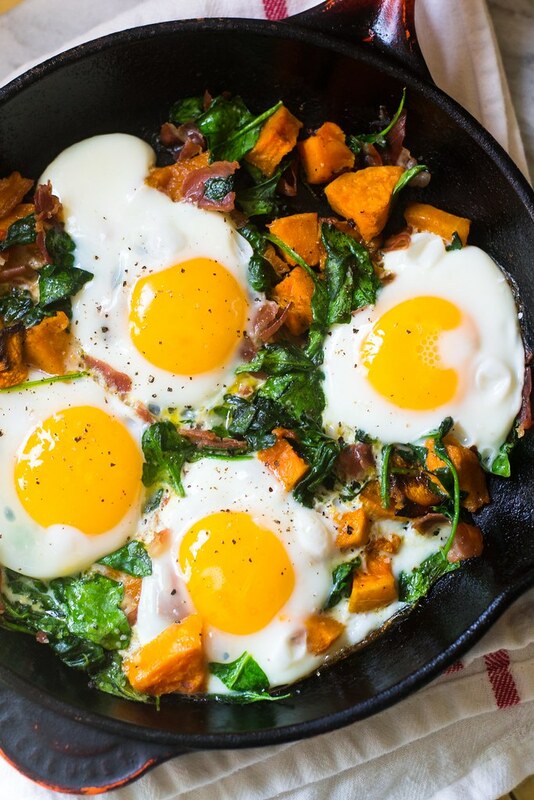 And speaking of breakfasts, how can anyone get tired of eating butternut squash hash for breakfast? No one, never, ever. I could eat for all month long…and we did! The key here is to prep and roast a bunch of veggies early in the week. I used them in breakfasts, salads and dinner sides. 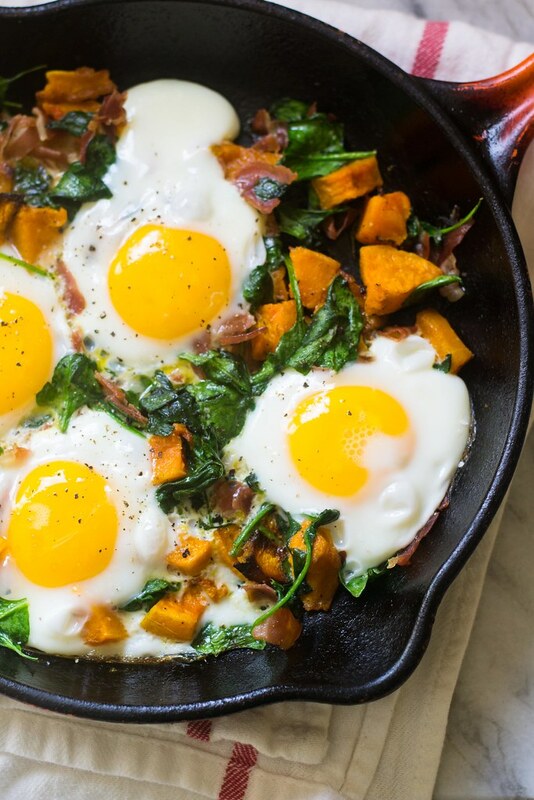 Once you throw in some cooked squash, spinach and prosciutto, just add eggs and you’re set. And promise me you’ll cook in nothing but cast iron for the rest of your life…it gives such awesome flavor and texture! In a medium cast iron skillet (or any skillet you have), drizzle a bit of olive oil (or 1 Tb ghee) and place on medium heat. Add diced prosciutto and cook until crispy and all fat is rendered. Then add in the butternut squash and spinach and cook for 1-2 minutes until the spinach wilts and butternut squash is warmed. Then use a spoon to make 4 indents into the hash. Crack an egg into a separate bowl (this is always a good idea just in case you get a bad egg) and then slowly pour the egg into its pocket. Lower the heat to medium-low and continue to cook the eggs until the whites are set. You may want to cover the pan with a large lid to help cook the top, for about 6-8 minutes (depending on desired yolk doneness). Once done, enjoy straight from the pan or on a plate. This is also fabulous with hot sauce, salsa and avocado! Please note that this hash is already made with cooked and roasted squash, which I can suggest making a head of time so breakfast can be an ease.